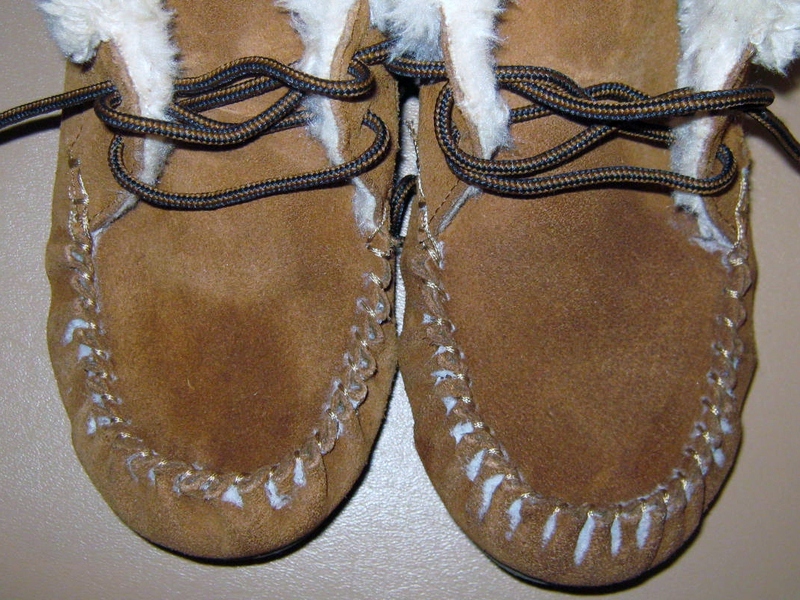 I received a pair of suede moccasin shoes/slippers for Christmas. They are super comfortable and I wear them all the time in the house. I knew that sooner or later they would be on the receiving end of a kitchen drip, and sure enough, in under two weeks they had a few oily spots marring them. I wanted to get rid of the annoying spots, but didn’t want to purchase overpriced suede cleaner. I’ve bought similar products in the past, and have found they haven’t been worth pennies, much less the near four dollars they cost now. Luckily for me I had recently read that plain shaving cream, not the gel type, would remove spots from a rug. I decided to try it out and sprayed a blob of shaving cream on the carpet, rubbed it in, let it sit for several minutes, then wiped it up with a damp cloth. The spot was gone. I wondered if it would work on my slippers too. 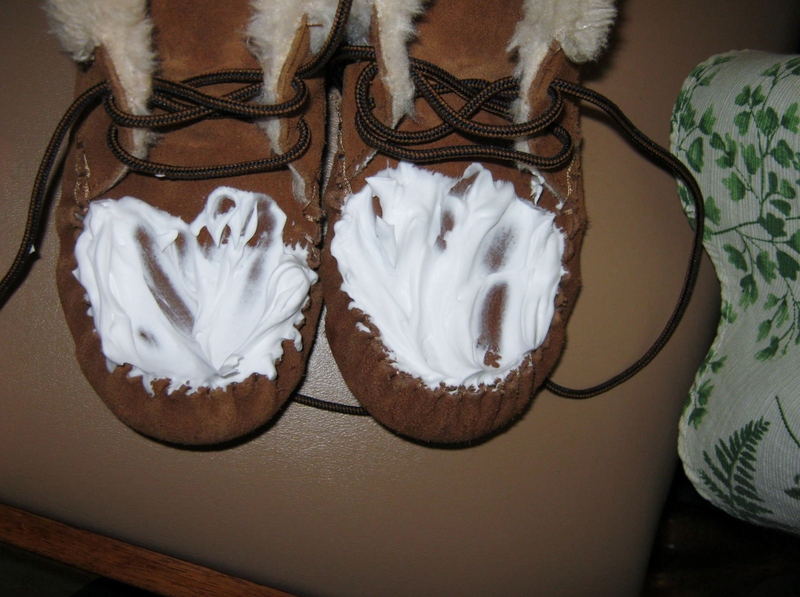 I covered the soiled areas on both slippers with a layer of shaving cream and let it sit for a few minutes. I then rubbed it in with a damp washcloth and let it sit a bit longer. In about a half hour I cleaned off any leftover residue and let the slippers dry. 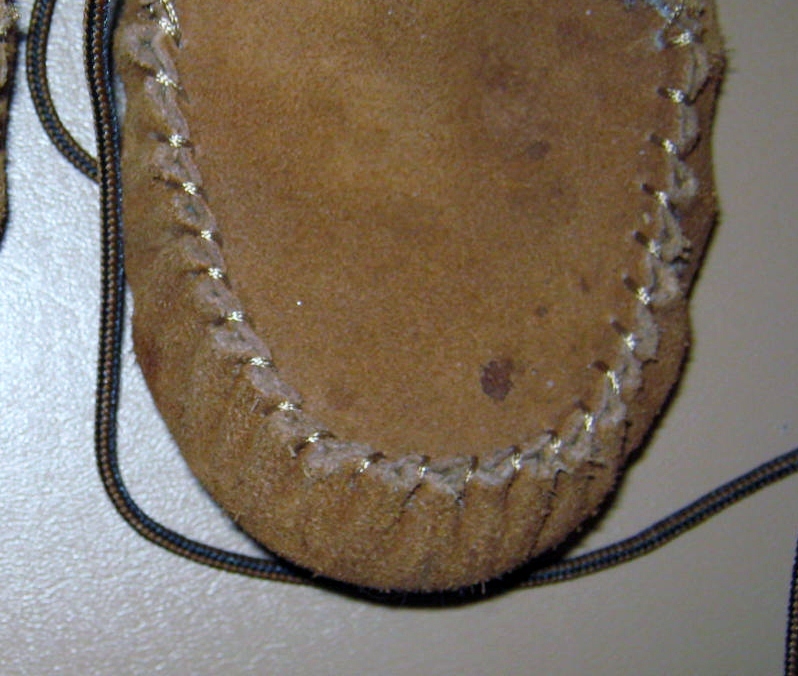 The large spots are gone, and once I brush the nap a bit, the slippers should look brand new. I think this is a sensational tip. I have also read you can use shaving cream to remove spots on your upholstery. I’m going to wander around the house, shaving cream in hand, and see what kind of grime and old ground in dirt I can remove. Nice tip, Kathy. I am looking for posts of yours I hadn’t read, yet and came here. Only the husbands may not be too happy ! You don’t mean the foam type cream, do you ? Do you have any home remedies to decrease or remove scars of old burns – I burn myself everytime I put my hand in the oven. Or scars from injuries/cuts ? I am with you on burns. I always get them on the sides of my wrist from accidentally touching the oven when I pull out baking pans. I have never found anything that works other than time…I will sometimes have a slight mark on my arm for a year or more…eventually it fades.